How do I register with ViMuseo? How do I log in to my ViMuseo account? How do I add multiple museums to my account? How do I edit the information about my museum? How do I add texts to ViMuseo? How can I edit the copyright notice? What is a Picture Caption? How can I edit the picture caption? How do I upload a Profile picture to ViMuseo? How can I change the Profile picture? How do I upload museum pictures to ViMuseo? How can I delete museum pictures? How can I present exhibits at ViMuseo? Why are the focal points so important for your museum? How do I add focal points for my museum? What are the contact details for my museum entry? How do I add contact details for my museum? How do I edit my own contact information? After a ViMuseo employee has checked the request, you will receive a link to the registration form. After you have assigned a password, you will get access to "My ViMuseo“. In the upper part of our website you will find "Login". If you move the mouse over "Login", a menu will open. 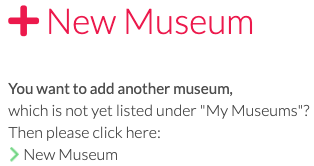 Click on "For Museums" and enter your username and password there. News Here we will keep you up to date with news about ViMuseo. If you are responsible for several museums, you can manage them under one account. Under New Museum, click "New Museum". After submitting the form, the data will be checked by a ViMuseo employee. The museum will then appear under My Museums. 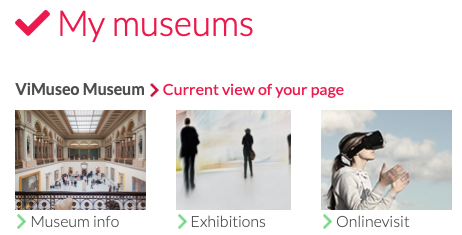 Click under My Museums on "edit" to edit the contents of the selected museum. Click in the green dotted area. A window opens in which you can enter the texts. Here you can present your museum to the users. Enter the opening hours of your museum. Enter information about the guided tour in your museum. Enter the entrance fees for your museum. Space to present other special features of your museum. After uploading the image you must fill out a copyright notice. This will be displayed below the image. Click in the green dotted area. A window will open in which you can edit the copyright notice. Once you have clicked on the pen icon, you can change the text. Then click the save icon to save the change. You have the opportunity to explain the picture in a few words. Click in the green dotted area. A window will open in which you can edit the caption. If you have clicked on the pen icon, you can change the text. Then click on the save icon to save the change. Upload a representative image of your museum. Click in the green dotted area. A window will open in which you can upload the picture. Click on "Upload new image" to open a path on your computer. Now select the desired picture and click on "open". Pay attention to the correct format: jpg, jpeg, png, gif, svg. To keep loading times low, a maximum image size of 300 KB is recommended. Click in the green dotted area. A window will open in which you can upload the picture. Click on "Upload picture" to open a path on your computer. Now select the desired picture and click on "open". To make your museum optimally visible in the search results, we recommend the 4:3 landscape format. In order to keep loading times low, we recommend a maximum image size of 300 KB. Show impressions from your museum - maximum six pictures. Click in the green dotted area. A window will open in which you can upload the pictures. 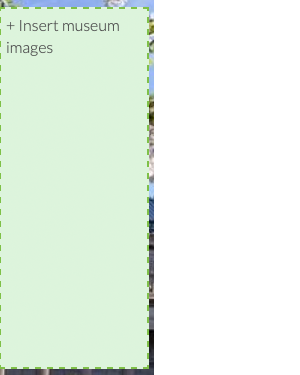 If you click on "Upload new image", a path of your computer opens. Now select the desired picture and open it. Fill in the input field for the copyright notice (see copyright notice). Fill in the input field for the picture caption (see picture caption). Click in the green dotted area. A window will open in which you can delete the images. Click on the delete icon to delete the image. Show what is in your museum and present your exhibits. Click in the green dotted area. A window will open in which you can upload the pictures of your exhibits. Click "Upload new image" to open a path on your computer. Now select the desired image and click "open". When selecting an object category, you have the option of specifying detailed information about the exhibit. If the exhibit cannot be assigned to a predefined category, select this option. Keywords: Enter terms that describe the exhibit. With the help of these keywords your exhibit can be found in the search. 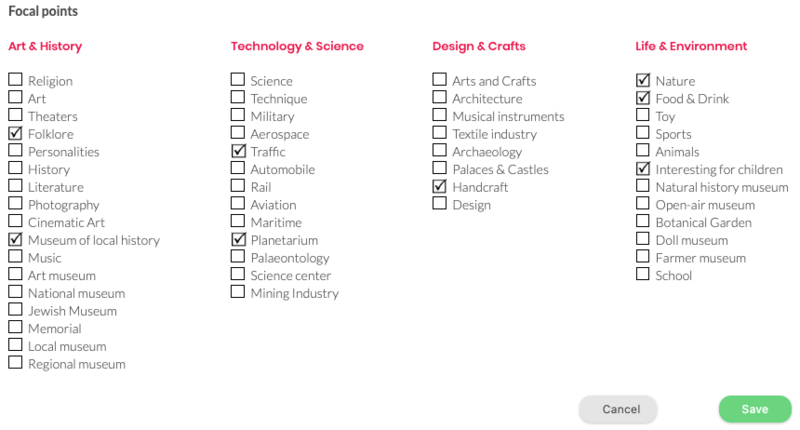 By selecting suitable focal points, the user is able to find your museum on the basis of his or her choice of interests. Example: If the user selects "Art", all museums in the desired area are displayed with the focus on Art. Click in the green dotted area. A window will open in which you can select the focal points of your museum. After selecting the appropriate focal points, click on "Save". 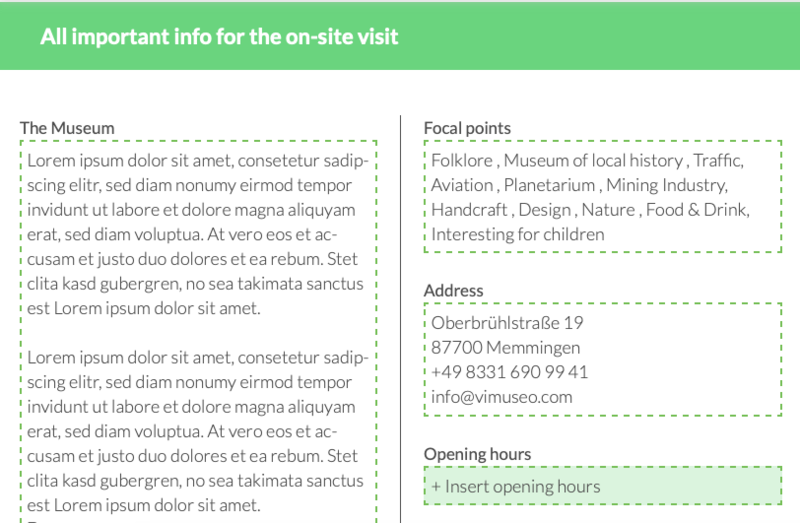 The contact data serve for the localization of your museum and to contact visitors. Click in the green dotted area. A window will open in which you can enter the data by clicking on the fields. If you are logged in and move the mouse over your username at the top of the header, a menu will open. Click on "Settings". Here you can enter and edit the data of the person who is responsible for entering and managing the information about your museum. Of course, the data will only be used for communication with ViMuseo and will not be published.